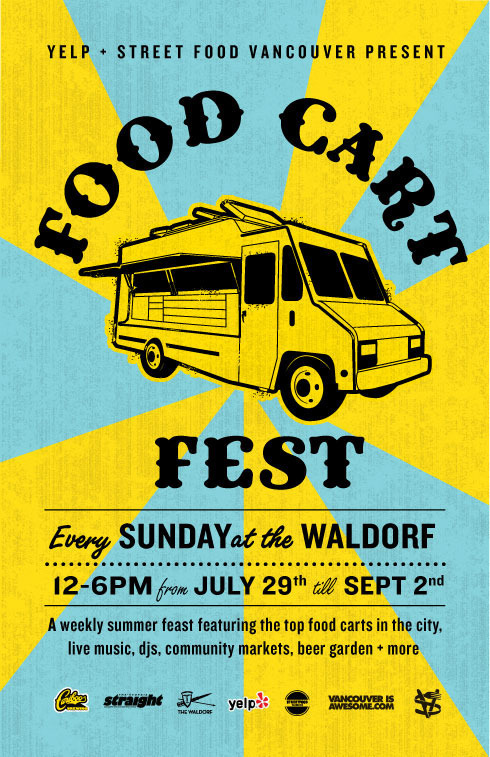 We're proud to be a sponsor of the Waldorf's Food Cart Fest, which will run every Sunday starting July 29th until September 2nd, noon to 6pm. The event will feature food trucks we've featured here before, some we haven't (Brasserie, Soho Road, Off the Wagon, Re-Up, Juice Truck, Mom’s Grilled Cheese, Cartel Taco, Streat Meat, Pig on the Street, Guanco, Holy Perogy, to name a few), setting up shop at the Waldorf's parking lot in a Portland pod stylee, stemming from the Waldorf's huge success with their Canada Day celebration. We'll try and feature a few of the vendors here as the weeks progress. Since we're all adults here, there will also be a beer garden accompanying, so instead of lining up at that ubiquitous brunch spot, why not stumble on over to the Waldorf for a different bite and some hair o' the dog? The Waldorf, of course, is an all-out renaissance venue, so along with drink n' nosh, there will also be a rotating series of Sunday markets: vintage clothes, farmers markets, comic book meet-ups, and more. Eat, shop, eye everyone in their summer Sunday best: it's all goooooood.